Denmark is a small country in northern Europe. It shares a border with Germany and is connected to Sweden by a road and rail bridge. Denmark is made up of a mainland and hundreds of islands. The capital city is Copenhagen. Other big cities in Denmark are Århus and Odense. Denmark has been a member of the European Union since 1973 and uses the Danish Krone as its currency. People have lived in Denmark since around 12,500 BCE. Over time, the original population mixed with people from other parts of Scandinavia (the region north of Denmark), the British Isles (UK and Ireland) and other nearby countries. Between the 8th and 10th century CE The Vikings (the name the Danish were known as at this time) invaded, traded with, discovered and fought people in other parts of Europe and North America. The Vikings discovered North America in the 10th century—over 400 years before Christopher Columbus (see Vinland). In later centuries, Denmark was closely associated with neighbouring countries and there was for many hundreds of years a union between Denmark, Sweden and Norway. In the late 19th century, Denmark had a period of cultural growth with the famous storyteller Hans Christian Andersen and the philosopher Søren Kierkegaard producing their most famous works. 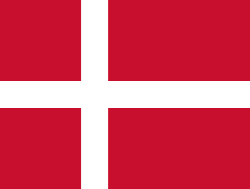 During World War II, Denmark was controlled by Germany's army (or "occupied") while its main colonies of Greenland and Iceland were occupied by the British and the USA. After the war, Iceland became an independent country. Denmark has been a member of the European Union since 1973 joining at the same time as the UK and Ireland. Denmark has thousands of islands including 443 which are named. Denmark is a very flat country and its highest mountain is Møllehøj, at 171 metres. Because of Denmark's indented coast and thousands of islands, Denmark has a coastline of over 7,300 kilometres. The climate in Denmark is temperate and the country experiences cold winters and cool summers. The Øresund Bridge connects the island of Zealand (where the capital is located) with Sweden measuring almost 8 km in total. No location in Denmark is more than 52 km from the sea. Just over 5.5 million people live in Denmark. The majority of people in Denmark are of Danish descent. There are small minorities from South Asia and the Middle East and Inuit people from Greenland and the Faroe Islands (both territories are possessions of Denmark). The national language is Danish, which is similar to English. Most Danes also speak English as well. Around 83% of the population are Lutheran Christians and 3.7% are Muslim. The most popular sports in Denmark are football, sailing, badminton, and handball. Like many other countries in northern Europe, Denmark is a monarchy but the king or queen does not have any real political power. The current ruler is Queen Margrethe II. Denmark is a popular destination for tourists and is very popular for short trips for visitors from Sweden, Norway, Germany, and the United Kingdom. Denmark's many sandy beaches attract large numbers of Germans and the capital city Copenhagen is popular with others especially tourists from the UK and Sweden—often because of the quality beers and lower prices compared to Sweden. The popular Roskilde Festival attracts music fans from all over Europe every summer. Denmark is home to 3 UNESCO World Heritage Sites including: Kronborg Castle and Roskilde Cathedral. This page was last edited on 1 December 2017, at 07:37.